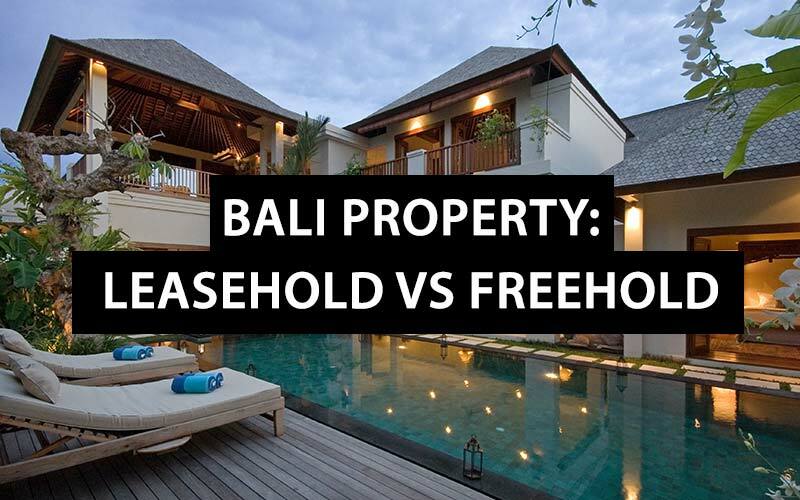 Bali Property: Leasehold vs Freehold. Here is What You Need to Know. If you are a foreign property investor, whether you choose to buy a leasehold or freehold property will depend on your particular needs. Freehold properties on Bali Island are still the most requested and purchased properties by foreigners, despite the necessity to use an Indonesian entity (nominee) as a titleholder for the land certificate, it is announced as completely illegal by Indonesian law & land regulations to purchase property in Indonesia by foreigners. When choosing whether to buy land freehold or leasehold, you should be aware of the ramifications of each with regards to the potential value of the investment. Purchasing land freehold allows you to enjoy over time, land value appreciation, which has been fairly dramatic in Bali in past years. With freehold, any appreciation in the value of the property, either through improvements you have made to it, or through the rise in land prices, you gain the benefit of any increase in value. Hak Milik or Freehold is the most complete and strongest form of land title ownership in Indonesia. Only individuals of Indonesian Nationality are entitled to own land under a Hak Milik title. Consequently, neither limited liability companies (PT/Perusahaan Terbatas) nor foreign individuals may obtain land with a Hak Milik title. Subject to zoning restrictions, the Hak Milik title owner can use the land for any purpose, although it does not entitle the owner to exploit the natural resources found on or under the land. The title has no limit and may be sold, gifted, exchanged and bequeathed and may also be used in the form of a mortgage. Foreigners may, however, acquire land under a Hak Milik title in another form of entitlement called Hak Pakai or Right of use. Leasehold, on the other hand, means that after a certain period of time, the property and whatever improvements the leaseholder may have made, revert to the owner. In very simple terms, as time passes, your investment in leasehold property depreciates in value, because as the term of the lease gets shorter, the lease is less attractive to a buyer, should you want to sell the remainder of your lease. The terms and conditions of any extension to a lease, are usually built into the original agreement. Most lease agreements have some sort of extension option, although you should be careful to fully understand the means by which the extension may be activated. Sometimes the extension can only be activated by mutual agreement, which means that the time at which extension discussions can begin, it must also be agreed upon mutually by the landowner and the leaseholder. This can lead to problems if the landowner does not agree to give an extension at the time the leaseholder requires it. Leasehold still has some advantages (and in some areas these days such as Seminyak, freehold is difficult to obtain), the main advantage being that it is a more affordable option. For example, if there were two identical villas side by side, one leasehold over a 40 year period and the other freehold, the leasehold villa would generally be about 2/3rds of the price of the freehold option. If you decide to buy leasehold, the drafting of any leasehold agreement should be carried out with the assistance of a third party legal advisor, since guaranteeing renewals and limiting rent increases is the key to a cost-effective leasehold structure. A lease agreement/contract must be documented at a notary public (PPAT) and the notary will do a full due diligence on the property, so that the agreement and all property documentation meets the legal requirements for the transaction to progress. This is a long-term lease contract. Although the land title is not under the foreigner’s name and remains under the ownership of the original owner, the land can be rented for an initial period of around 25 years and can then be extended up to a period of 70 years. After the lease begins, the owner’s title of Hak Milik (Right to Own) will be legally transferred to the foreigner under the Hak Sewa title (Right to Lease). If the leasehold is not renewed once it expires, all rights go back to the original owner and it becomes a freehold Hak Milik property again. Do I have the right to sell my lease? Yes, you have full control of the leasehold title if you do not wish to continue leasing it, but the less years left on the lease, the less the property value. Do I have restrictions on selling, if I can in fact sell the lease? As far as our understanding, you are entitled to sell the lease agreement at anytime, but if the leaseholder departs from Indonesia permanently, the property must be sold or transferred within one year after departure. If the foreigner or his family does not use the property for more than 12 consecutive years, then the foreigner forfeits the “being domiciled” status, for the purpose of owning residential property. Can I pass the lease to my family member? Yes, you can pass the lease title to your family & ‘will’ it to a family member, as you own the rights of the lease for the duration that you paid for. The landowner cannot break the lease agreement with you and must fulfill the terms and conditions of the lease agreement. Can I sublease the property or rent it out? Yes, you can rent / sublease the property when you are not staying in it, so it can also be a very lucrative investment. However, if you do decide to rent out the property as a short-term/holiday rental, you must first acquire a Pondok Wisata (rental license).